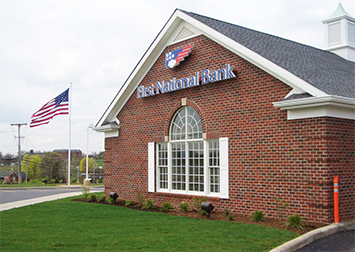 First National Bank in Martinsburg, Pennsylvania offers an array of banking services and solutions designed to conveniently serve you. Our dependable team members are ready to assist you with all your banking needs. Visit this branch at 113 W Allegheny St or give us a call today at 814-793-2154 to learn more about our full range of commercial banking, consumer banking and wealth management solutions. Offering a 24-hour ATM for your banking convenience, this First National Bank branch in Martinsburg, PA is located at 113 W Allegheny St. For after-hours banking, you can use our ATM to make deposits, withdraw cash or check your balance. Or, if you need help from one of our friendly team members, please stop in during normal business hours and we will be happy to assist you. First National Bank was founded in 1864, and offers a full range of commercial banking, consumer banking and wealth management solutions. If you are coming from near Williamsburg, PA, head south on PA-866 S/High St/Piney Creek Rd toward W 1st St for 13.1 miles and turn right onto W Allegheny St. Arrive at First National Bank (113 W Allegheny St, Martinsburg, PA 16662). If you are coming from near Woodbury, PA, head northeast on PA-36 N/Main St toward State St for 0.7 miles and turn right onto PA-866 N. After 5.6 miles turn left onto W Allegheny St. Arrive at First National Bank (113 W Allegheny St, Martinsburg, PA 16662). If you are coming from near Saxton, PA, head north on 8th St and turn left onto PA-913 W/Main St. After 1.4 miles continue onto PA-26 N for 3.6 miles. Turn left onto PA-164 W and continue for 7 miles. Arrive at First National Bank (113 W Allegheny St, Martinsburg, PA 16662). If you are coming from near Roaring Spring, PA, head north on Williams St/Woodbury Pike, turn right onto PA-164 E/E Main St and continue for 4 miles. Arrive at First National Bank (113 W Allegheny St, Martinsburg, PA 16662). With hundreds of branch locations and stand-alone ATMs across several states and three major metropolitan areas, it’s easy to find a First National Bank near you. You can search by city and state, or simply enter the zip code for a list of FNB locations nearby. To browse our ATMs and branches by state, click the links below.